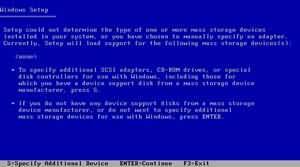 Step 2 - At this stage it will ask you to press F6 if you want to install a third party Raid or SCSI driver. If you are using a an IDE Hard Drive then you do not need to press F6. 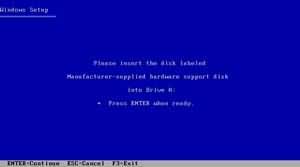 If you are using a SCSI or SATA Hard drive then you must press F6 otherwise Windows will not detect your Hard Drive during the installation. Please make sure you have the Raid drivers on a floppy disk. Normally the drivers are supplied on a CD which you can copy to a floppy disk ready to be installed. If you are not sure how to do this then please read your motherboard manuals for more information. Step 3 - Press S to Specify that you want to install additional device. Step 4 - You will be asked to insert the floppy disk with the Raid or SCSI drivers. 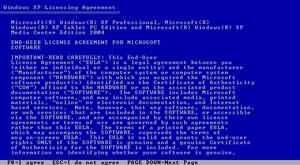 Press enter after you have inserted the disk. Step 5 - You will see a list of Raid drivers for your HDD. Select the correct driver for your device and press enter. Step 11 - After the setup has completed copying the files the computer will restart. 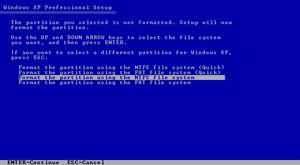 Leave the XP CD in the drive but this time DO NOT press any key when the message "Press any key to boot from CD" is displayed. In few seconds setup will continue. 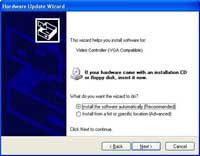 Windows XP Setup wizard will guide you through the setup process of gathering information about your computer. Step 12 - Choose your region and language. Step 14. Enter your product key. Step 15 - Name the computer, and enter an Administrator password. Don't forget to write down your Administrator password. Step 16 - Enter the correct date, time and choose your time zone. Step 18 - Choose workgroup or domain name. If you are not a member of a domain then leave the default settings and press next. 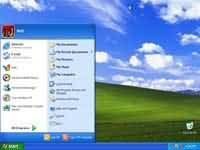 Windows will restart again and adjust the display. 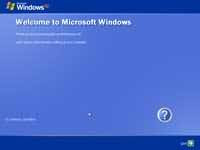 Step 19 - Finally Windows will start and present you with a Welcome screen. Click next to continue. 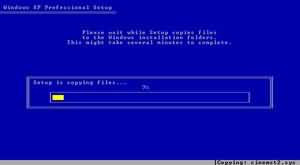 Step 20 - Choose 'help protect my PC by turning on automatic updates now' and press next. Step 21 - Will this computer connect to the internet directly, or through a network? If you are connected to a router or LAN then choose: 'Yes, this computer will connect through a local area network or home network'. 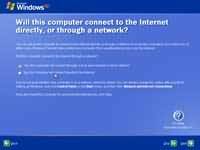 If you have dial up modem choose: 'No, this computer will connect directly to the internet'. Then click Next. Step 23 - Add users that will sign on to this computer and click next. Step 24 - You will get a Thank you screen to confirm setup is complete. Click finish. If there are any yellow exclamation mark "!" next to any of the listed device, it means that no drivers or incorrect drivers has been loaded for that device. In our case we have a Video Controller (VGA card) which has no drivers installed. Your hardware should come with manufacturer supplied drivers. You need to install these drivers using the automatic setup program provided by the manufacturer or you need to manually install these drivers. If you do not have the drivers, check the manufacturers website to download them. (a) From the device manager double click on the device containing the exclamation mark. (b) This would open a device properties window. (c) Click on the Driver tab. You now get two options. The first option provides an automatic search for the required driver. The second option allows you to specify the location of the driver. If you don't know the location of the driver choose the automatic search which would find the required driver from the manufacturer supplied CD or Floppy disk. 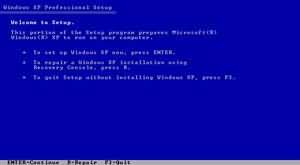 Windows would install the required driver and may ask you to restart the system for the changes to take affect. Use this procedure to install drivers for all the devices that contain an exclamation mark. Windows is completely setup when there are no more exclamation marks in the device manager.